Draft Highlights: Jordan De Goey Watch the junior highlights of Jordan De Goey, who was drafted to Collingwood with selection No. 5 in the 2014 National Draft. With selection No. 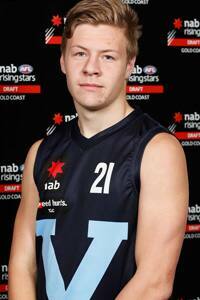 5 in the National Draft, Collingwood has welcomed Jordan De Goey, a midfielder from the Oakleigh U18s. Profile: A competitive and versatile medium defender/midfielder. Strong overhead and in one-on-one contests. Good decision-maker by hand and foot, and impressed for Victoria Metro in the NAB AFL Under-18 Championships, averaging 15 possessions and three marks at 74 per cent efficiency. Provided a spark up forward by booting three goals in the Oakleigh Chargers' Grand Final win, playing mainly forward. Makes the most of his opportunities. "Jordan’s a unique player who is able to play in all areas of the ground. He’s a super competitor, makes good decisions and kicks the ball really well so he ticks a lot of the boxes of what AFL clubs want, but his agility makes him a rare commodity in the draft. He wins his one-on-ones and tends to pop up when the game needs to be decided. I wouldn’t be surprised if he really crept up the draft and went in the top handful of picks," – Oakleigh Chargers talent manager Mark Smart, Inside Football, November 2014. "A high-intensity utility who can move between the midfield, forward and back lines and find ways to impact games. He's a hard, tough competitor who is a more natural ball-getter than some of the other players floating around in this part of the draft. A very solid bet," - Emma Quayle, The Age, November 2014. "The clubs that like De Goey rate him very, very highly – and with good reason. He's a win-the-ball-at-all-costs type of player who loves fighting for it, pushing an opponent out of the way and making it his. But he also lifts when his team needs him, he kicks goals and takes strong overhead marks for his size. With some more development, he has the frame and skills to become a premium midfield option. For the short-term, he'll probably start as a high half-forward," - Callum Twomey, AFL.com.au, November 2014. "The Magpies want versatility and classy ball use and De Goey offers both. The midfielder is hard-nosed over the ball but also tracked at an amazing 80 per cent kicking efficiency at the national championships," - Herald Sun, November 2014. The upside: De Goey plays at a high intensity, all of the time. He's spent this year being tossed around a few different spots, but seems best placed as a rotating medium forward and midfielder, where he can use his smarts and skills.The best things about De Goey are his competitiveness and decision-making. He's happy to fight for the ball, push others out of the way and do anything to make it his. But when he has the ball he does the right thing with it, sometimes overlooking the obvious option to find another that works out better. In the midfield De Goey's clean ball-handling and doggedness make him a tough match-up, and in attack he can play as a one-out forward, as a flanker or a crumber and find a way to hit the scoreboard.Good things tend to happen when De Goey is around the ball, and he knows how to use his body and impact the play. He kicked 14 goals for the Chargers in nine games, including three in the TAC Cup Grand Final when he helped turn the game his team's way. If he's to move more into the midfield, De Goey will need to pick up a few more disposals. For the Chargers and Vic Metro he only averaged 15 touches a game, and although he's a quality over quantity player at the moment, if he can push that number up a few notches he should be better placed to make an even bigger impact. Plays like: He's a bit like Geelong's Josh Caddy in his ability to play across half-forward and push into the midfield, but then wheel around and kick goals. At 187cm, De Goey is a touch taller than the young Cat, which helps his overhead marking (he averaged six marks a game in the TAC Cup), another strong part of his game. Bottom line: De Goey is a game-breaker who is go, go, go. He mixes a fierce desire with some class, he sees things unfold before others and makes the most of it, and likes being in the thick of the action – whatever role he's playing. Strong, hard-headed and confident, De Goey has a lot to offer.